To determine whether a combination of anti-oxidant and mitoprotective properties could reverse mitochondrial dysfunction in treated glaucoma patients by reducing mitochondrial flavoprotein fluorescence compared to placebo. Retinal Metabolic Analysis (RMA) measures mitochondrial flavoprotein fluorescence (aFPF) and its average curve width (ACW), which are markers of mitochondrial oxidative stress. Twenty patients were randomized into two group: 1) placebo and 2) a combination of curcumin, Ginkgo biloba extract, citicoline, coenzyme-Q10 (ubiquinol, Cognizin™), N-acetyl-cysteine, alpha-lipoic acid, grape seed extract, and green tea extract (Glaucohealth™)*. The study was performed under an IND from the FDA. Patients were tested with visual fields (VF), optical coherence tomography (OCT), and the retinal metabolic analyzer (RMA) at baseline, 1, and 3 months after randomization. Hierarchical mixed effects linear models tested for changes in VF, OCT, and RMA indices over time. There were no significant changes in VF (MD, PSD) or OCT (macular RGC) indices in either group (all P>5%). 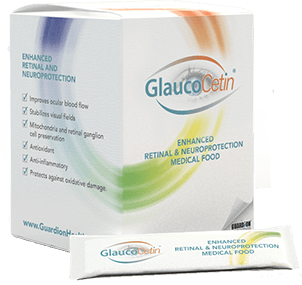 There was a significant decrease in optic nerve aFPF and ACW from baseline to 1 month in patients treated with GlaucoHealth™* (β=-39, P=0.003; β=-25, P=0.01; respectively) but not in patients treated with placebo (p=0.47 and 0.30). Mitochondrial dysfunction and death are increasingly implicated in retinal ganglion cell death in glaucoma and neuronal death in other neurodegenerative disorders. 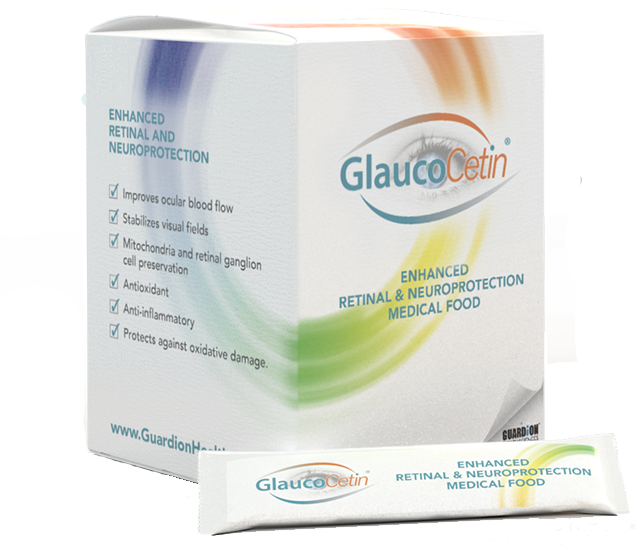 Glaucoma can develop and progress with low intraocular pressure. Formulations with IOP-independent neuroprotective effects could be additive in slowing progression rates by reversing mitochondrial dysfunction. A combination of mitochondrial protectants and anti-oxidants (GlaucoHealth™)* reversed mitochondrial metabolic dysfunction measures with RMA. This finding serves as a proof-of-concept for future trials testing the neuroprotective effect of micro nutrient combinations in glaucoma. 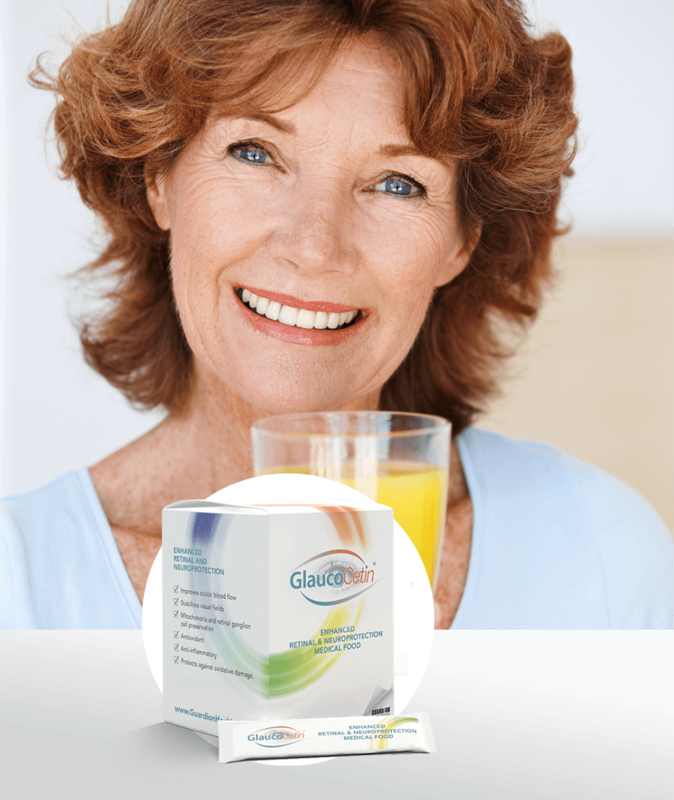 GlaucoHealth™* reverses mitochondrial dysfunction and may be neuroprotective in glaucoma. This finding serves as a proof-of-concept for future trials testing the neuroprotective effect of micro nutrient combinations in glaucoma.